Dr. Venessa's Formulas are the result of over 15 years of successful Clinical research & health services provided to thousands of people with all types of health conditions. "Clinical experience, effectiveness, safety, quality raw materials and affordability is our seal of excellence." Dr. Titus Venessa Ph.D., Sc.D. is the Founder and President of Dr. Venessa's Formulas. 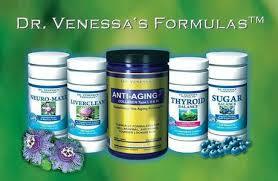 Dr. Venessa's original company was established in 1992 with a focus on natural food stores. Today, 16 years later, the retail division operates independently and has allowed our focus to become even more defined. Dr. Titus Venessa, Ph.D., Sc. D. is a Lecturer, Author and Research Scientist in the fields of Integrative and Complimentary Medicine and Food Sciences. He is graduated in Neuro-psychology (Ph.D.) and Health Sciences and Nutrition (Sc.D). Since 1992 Dr. Venessa has been conducting clinical case studies with individuals, with a variety of health disorders. Dr. Venessa's success has been eminent due to several factors: he has developed a new therapeutic approach to evaluate Drug Induced Nutrient Depletion and its side effects on individuals using prescription medications and studied new combinations of nutraceuticals to replenish drug and nutritional depletions. Dr. Venessa has also specialized in Herb Contraindications and Drug Interactions based on interference with either the activity or the kinetics of the drug such as changing its absorption, metabolism, binding, or elimination. Dr. Venessa is the Founder and President of Dr. Venessa's Formulas specialized in formulating the Most Advanced Natural Formulations in the Food Supplement Industry. Dr. Venessa's Formulas is an established manufacturer with a unique line of Specialized and Targeted Formulas, which are the result of successful clinical research and health care practice provided for about two decades to thousands of people with all kind of health conditions.